The two goals decided the bonus point allocation in Saturday’s stalemate on Teesside. Alvaro Negredo (£6.5m) collected the maximum bonus points on his debut for the hosts. The clinical Spaniard found the net with his only effort of the match, earning a score of 30 in the Bonus Points System (BPS), and also created one scoring chance for his team-mates. Xherdan Shaqiri (£6.5m) received two bonus points, with 22 in the BPS. Stationed on the right of Mark Hughes’ 4-2-3-1 formation, the Switzerland international produced four attempts on goal and fired a free-kick equaliser in the second half. Potters’ central midfielders Glenn Whelan and Giannelli Imbula picked up a single bonus point apiece after scoring 18 in the BPS. The pair both won two tackles, with Whelan also managing two blocks and Imbula producing two recoveries and seven successful dribbles. Stewart Downing (£5.5m) was ranked top in the ICT Index. The Boro midfielder also recorded the highest ICT Creativity score of 50, having produced three goalscoring chances and completed four crosses for Aitor Karanka’s side. Negredo and Shaqiri were placed first and second for ICT Influence, though the Potters’ Marko Arnautovic (£7.5m) led the way for Threat with a score of 35. The Austrian produced five attempts on goal – more than any player in the match – though failed to register a single shot on target. He also created two chances for his side. Negredo’s goal has already earned more transfers in than any forward in the Gameweek, with over 53,000 Fantasy Premier League managers drafting him in. The upcoming fixtures offer the summer signing a chance to maintain his fine start as Karanka’s outfit face Sunderland, West Bromwich Albion, Crystal Palace and Everton over the next four Gameweeks. Gaston Ramirez (£5.5m) is another candidate to consider. The Uruguayan earned the assist for Negredo’s opener and managed two shots inside the box – more than any team-mate. Ranked in the top three for both ICT Influence and Creativity, he also took the majority of the hosts’ corners. Similar to Ramirez, George Friend (£4.5m) collected 17 in the BPS – just a single point short of a bonus. The left-back produced two interceptions, 10 recoveries and three clearances, limiting the visitors to a single shot on target. He also registered five successful dribbles. 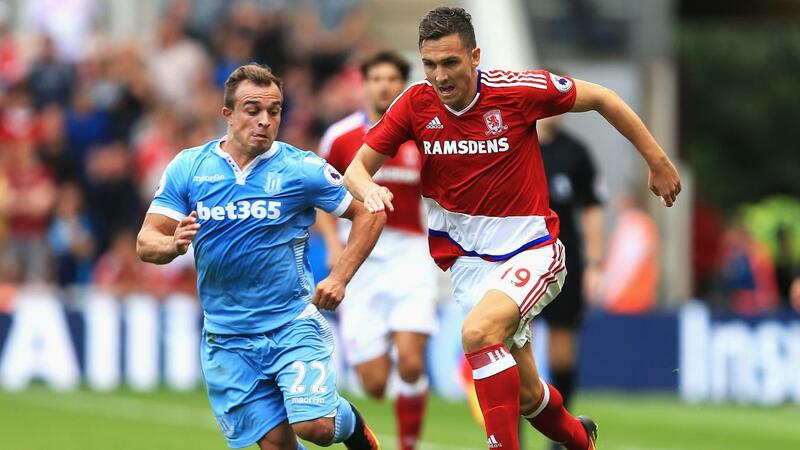 Shaqiri’s share of set-pieces suggests he could rival Arnautovic in the Potters’ midfield, though the latter, who scored 11 times last term, was unfortunate not to score and fired four shots from inside the Boro penalty area.